Offering an alternative version of the history of modern Scottish art, this book challenges the accepted view of the dominance of the Scottish Colourists and the influence of France, by examining the most progressive work made by leading and lesser-known Scottish artists. Three important modernist artworks are introduced below, alongside expert commentary, ahead of the major forthcoming exhibition. Edward Baird, The Birth of Venus, 1934. Oil on canvas, 51 x 69 cm. 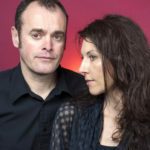 Scottish National Gallery of Modern Art, Edinburgh: accepted by HM Government in lieu of inheritance tax and allocated to the Scottish National Gallery of Modern Art, 2002. © Graham Stephen. This is a rare example of Scottish Surrealism. It was painted as a wedding present for the artist James McIntosh Patrick and his wife, who were married in 1934. McIntosh Patrick said of Baird’s gift, ‘It rather shocked me as he painted so few pictures yet he gave this one away. He was our best man and, being a sentimental person, he chose Venus, the goddess of love, as the subject of the painting. He was a keen Scottish Nationalist; he also admired Botticelli and Crivelli. Hence the “Scottish Venus” as he called it, arose out of his associations with a wedding, his involvement with Scottish Nationalism, his love for messing about in boats, and his love of Botticelli.’ The grey filters, mirror and circular plate in the top left of the painting belong to a sextant. The woman, presented on the beach at Montrose, is Ann Fairweather, Baird’s fiancée and later (from 1945) wife. 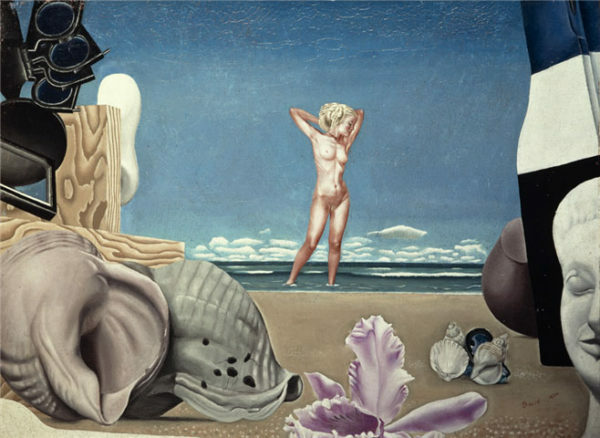 When the painting was exhibited in Montrose in 1935, the Montrose Standard noted: ‘This is in the type of the school of Surrealism, and supporters of this school will recognise its beauty and splendid detail’. Robert Burns, The Hunt, c.1926. 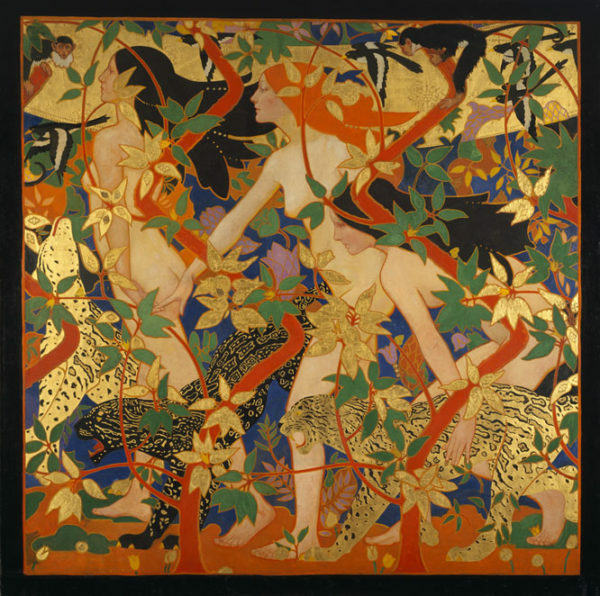 Oil or tempera and gold leaf on canvas, 198.1 x 198.1 cm. Scottish National Gallery, Edinburgh: purchased 1987. This painting was produced as part of the commission for Crawford’s Tea Rooms in Edinburgh and was originally a panel fitted into a staircase. The previous title of the work was Diana and Her Nymphs, but – as none of the traditional attributes of the goddess (the moon, bow and arrow), which Burns was always careful to include in his other depictions of Diana, are present – it was later renamed The Hunt. An adaptation of the female figure at the centre of this work featured on biscuit-tin labels for William Crawford & Sons. A separate panel (now lost) was titled Diana the Huntress and is thought to have related to this work, indicating that the figures here may be followers of Diana. The animals depicted in this vibrant panel have been identified as white-headed capuchin monkeys; a magpie tanager; and ocelots or ‘dwarf leopards’. A personal touch by the artist is the small green car at the bottom: a nod to his passion for motoring. 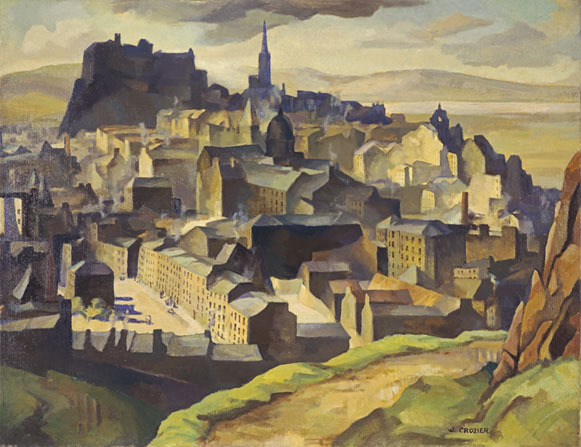 William Crozier, Edinburgh (from Salisbury Crags), c.1927. Oil on canvas, 71.1 x 91.5 cm. National Galleries of Scotland: purchased 1942. Being a little older than his friends, Crozier’s influence can be seen in much of their earlier work, and he has been an overlooked presence in the Edinburgh School perhaps due to his early death at the age of only thirty-seven. Crozier died in December 1930, after a fall in his studio which caused a cerebral haemorrhage. He had been elected as an Associate member of the RSA in March of that same year. This view of Edinburgh from Salisbury Crags clearly shows the lessons Crozier had learnt from his time studying with André Lhote in Paris. Lhote favoured a cubist approach to formal composition, where the subject is simplified into cubes, cylinders and cones, as famously described by Cézanne. While still anchored in realism, the synthesis of Crozier’s Edinburgh, seen from a viewpoint along the Radical Road, owes much to his experience in Paris but also nods in the direction of S.J. Peploe, an artist whom Crozier knew and greatly admired. The high viewpoint allows Crozier to take full advantage of the strong northern light across the city, with the dark mass of Edinburgh Castle in the background. A New Era: Modern Scottish Art 1900-1950 by Alice Strang will be published in January 2018 by National Galleries of Scotland. The book accompanies an exhibition to be held at the Scottish National Gallery of Modern Art, Edinburgh from 2 December 2017 to 10 June 2018.